By default, Mexican food is typically vegan friendly, and the menus in most Mexican restaurants are relatively simple to navigate. You can usually count on beans (but you’ll need to ask if they have been cooked with meat stock or seasonings), rice (you’ll have to ask if it’s cooked in chicken stock), guacamole (surprisingly, sometimes made with sour cream), and grilled vegetables (check to see if these guys were cooked in butter). So maybe Mexican food is not simple to navigate after all. Luckily, for those of you dining at San Angel Inn located in Epcot’s Mexico pavilion, I have some tips to offer! First, get the tortilla chips with two types of salsa. Sometimes, tortilla chips make life worth living. 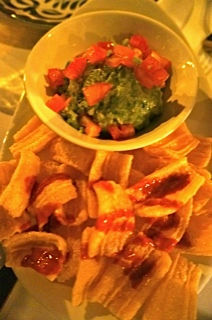 I often like to request an order of guacamole, as an appetizer for chip dipping (it’s a chip ‘n’ dip…anyone?…anyone?). The guacamole comes with crunchy chips for dipping, and although I’m told they’re vegan, I’ve never been interested in them. I stick with the chips instead. 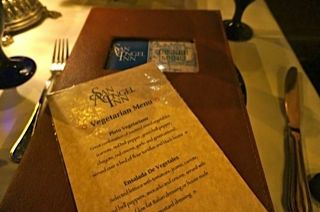 San Angel Inn has a vegetarian menu available upon request. It is slim, boasting two items, in comparison to the regular menu, which is pretty extensive. Nevertheless, I always appreciate having my options clearly labeled in this way, to prevent any confusion. 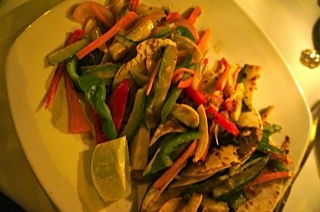 The two available options are the Ensalada de Vegetales: a salad which includes a host of vegetables (jicama, zucchini, peppers, avocado, tomatoes), or the Plato Vegetaraino: essentially, soft vegetable tacos. I typically opt for the Plato Vegetariano, as it is more substantial, and to my knowledge neither the low-fat Italian or honey mustard dressings for the salad are vegan. Please note that neither item contains dairy! That’s right! No sour cream or cheese on either of these, just watch out for the salad dressings. My advice? A little bit of fresh lime squeezed right on top makes for a delightful dressing alternative. The Plato Vegetariano features peppers, zucchini, onions, carrots, and jicama atop a bed of black beans, on top of flour tortillas. 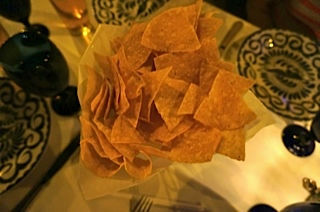 The portion is quite large and will feel that way, especially after you have just eaten your weight in tortilla chips. It’s like having three overly filled soft shelled vegetable tacos, which I think makes for an excellent entree. If you have some guacamole left over from your appetizer, that can also make a nice accompaniment to this entree if you’re an avocado fan. If you’re not an avocado fan, I’m not sure we can be friends. Though none of the desserts currently offered are vegan, I have never finished a meal at San Angel Inn with the desire for dessert. 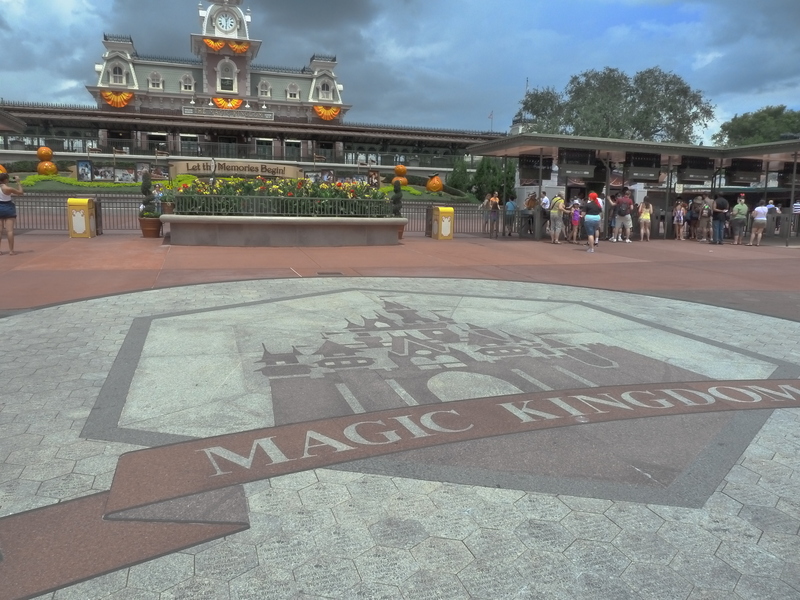 Since I eat the same dish each time I’m here, I do not necessarily visit San Angel Inn just for the food. What really keeps me coming back is the ambiance. I completely adore the inside of the Mexico pavilion, it reminds me so much of real Mexico, which I love dearly. The theme is absolutely perfect. Being seated at a table near the water is on the shortlist of my life goals. It has not happened just yet, but I am patient, and I like chips and guacamole, so I will keep trying. I agree, the atmosphere is wonderful. It’s just a nice place to sit and rest sometimes too. If your a guacamole fan, why would you even think of having any left over?